Tomas Alfredson’s 2008 film Let The Right One In is based on a novel of the same name published in 2004. The novel’s author, John Ajvide Lindqvist, also worked on the screen play. So fans of the book shouldn’t be too disappointed with the film adaptation. With the transition from novel to screen play, Lindqvist removed most of the sub-plots and minor characters, essentially boiling the story down to its core: the relationship between Oskar and Eli. To call Let The Right One In a vampire, horror flick would be misleading. It is more a coming-of-age tale about two pre-teens, one of which happens to live off of blood. Sure, there are bloody moments, but these aren’t the driving force. This movie came out during the heyday of vampire films, shortly before the release of Twilight. However, Alfredson and Lindqvist treat the subject quite reverently and with respect. There are no monstrous bat-creatures, seductive men, or UV based weapons here. Only a lonely 12 year old girl trying to survive. If vampires really existed, I’d imagine they’d be like this. The story takes place in 1980s Sweden. Oskar is a young boy, bullied at school, with violent fantasies of revenge. He has no friends, that is until a mysterious girl, Eli, moves in next door. They become friends, but Oskar notices that there is something different about her. But he doesn’t let her strangeness stop him from forming a strong relationship because he also notices a kindred spirit. With Eli’s support, Oskar is able to fight back against his tormentors. “Hit back even harder,” she advises him. Eli has a guardian (whose relationship is never explored in the film) who risks himself to procure blood for her. After some mishaps, people catch on to something strange happening in their community. Eli decides that she must move on to a different location. However, their friendship continues to grow as they “go steady”. This is an innocent relationship as both just need a friend. They complement each other: Oskar has the desire for violence, but not the capability; Eli has the strength to commit murder, but does so only to survive. The casting for this was spot on. Kåre Hedebrant (Oskar) and Lina Leandersson (Eli) both have their acting debut here. And neither disappoint. They get into character and make them believable: Oskar as a socially awkward young boy and Eli as a person struggling to survive. It is hard not to sympathize with them and cheer for them as they perform acts of violence. I was proud of Oskar when he fought back against the bullies and I was anxiously hoping Eli would not be caught while hunting. Even the bullies at school are more relate-able than one would assume. Like I said, this is not a horror movie. There are no jump scenes or gross-out moments. However, this film is hauntingly beautiful, albeit a little disturbing. (While they take second place to story, the bloody moments are done tastefully. LTROI probably has the most stunning dismemberment scene in all of cinematic history.) The cinematography is exceptional. The snowy setting provides a scenic backdrop for the heartfelt story. The whitewashed environment underscores the tone and feel of the movie so well that I can’t imagine the film being set during any other season. The musical score is magical. It is lonely and poignant, although with a sliver of hope. The composer, Johan Soderqvist, does a wonderful job in capturing the essence of the movie in the music. However, no matter how good a film is, there are always mistakes. In this case, most of these come from the simple act of transcribing the book to a movie. As mentioned before, Lindqvist cut away all minor characters and subplots; but these were not all clean cuts. There are a few things left in the movie that can cause some head-scratching due to the explanation being removed. Eli’s guardian is a good example. In the book, he has a huge back-story and subplot. In the film, he merely gets blood for Eli and dies halfway through. Their relationship is ambiguous. Another is Oskar’s father (who is simply an alcoholic). But the biggest mistake is how Eli’s gender was handled. There are a few subtle hints (“I’m not a girl” she says or the blink-and-you’ll-miss it shot of her changing). But these can be interpreted in numerous ways; there is not enough explanation to warrant their inclusion. That is one way (and probably the only way) that the American remake improved on this Swedish masterpiece. They either removed these things completely or added more of an adequate explanation to avoid confusion. As a whole, this is a great film. The story is strong and believable. It is a nice, new twist on an age-old tale. Oskar and Eli are strongly developed. The two young actors bring these characters to life and invite us into their world. The snow covered suburb parallels the loneliness of the Oskar and Eli. The score matches perfectly the mood of the film. Yes, there were a few things that could have been transferred better from novel to screenplay. However, these are relatively small compared to the grandness of this film. 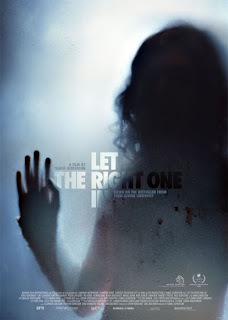 Let The Right One In shouldn’t have to ask to come in, we should have already invited it.